Matthew Gibney recognises that parents are the first educators of their children in faith, our Religious Education curriculum enables young people to see and respond to God in their lives. Religious Education, as part of the Church’s mission of evangelisation, shares in the task of spreading the Good News of Jesus Christ. Religious Education helps students to make sense of life in the light of God’s revelation. 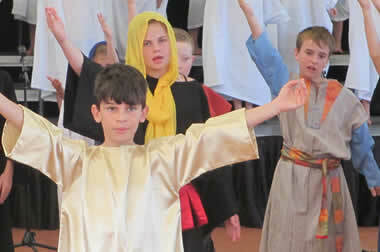 Our students follow the Religious Education Guidelines of the Archdiocese of Perth. Religion is formally taught daily in lessons that may range from 15 – 30 minutes in duration depending on grade level and content. Prayer takes place daily in the classroom. Opportunities for experiencing prayer and celebrating liturgy are regularly provided for the whole school community. The school celebrates significant Feast Days and liturgical events of the school, community and parish with Masses at St Francis of Assisi Church or here at School. Father Francis Ly, our Parish Priest, is a regular visitor to our school and attends school based liturgies throughout the year. Parents are encouraged and welcome to attend these occasions. Morning tea always follows our class liturgies to allow parents the opportunity to meet one another and spend time in the school. Matthew Gibney students are given the opportunity to make the sacraments of Eucharist (Year 4), Reconciliation (Year 3) and Confirmation (Year 6). The Sacramental Program is Parish based, and the school works closely with the St Francis of Assisi Parish Sacramental Team. The students are prepared through their class Religious Education units. There is an expectation of significant parental and family involvement, beginning with a Sacramental Commitment Mass in March, and Parent and Child Workshops throughout the year. Matthew Gibney Catholic Primary School is a MJR school. Making Jesus Real (MJR) is a programme designed to foster a relationship with Jesus that is real to the students and relevant to their daily lives. MJR is centred around the belief that we are the image of Jesus to all people around us. We are His representatives and our actions should reflect His values taught in the Gospel. Jesus told us that we are all part of His family and that the way we treat others should be reflective of the way we would treat Him. MJR has a simple message – Jesus is part of our lives and can change the way we live; that we can make Jesus real through our daily actions and words. An important aspect of MJR is learning how to recognise God Moments in an encounter with a friend, a cheerful greeting, a smile, a wink of encouragement, an offer of a helping hand or an unexpected compliment. MJR leads us to be ‘winners and grinners’ rather than ‘moaners and groaners’, to look for positives in each day, and to make sure we let others know how much we appreciate them in our lives, and how to pass on the Good News each day. Making Jesus Real is specifically linked to the school policies and teaching and learning programmes across all Key Learning Areas. These include the values of: showing care and compassion, respect, honesty and trustworthiness, understanding, tolerance and inclusion. These values also encourage students to do their best, treat others fairly, be responsible for their actions and follow school rules and procedures. The Matthew Gibney Mini Vinnies Team is a group of students from Year 5 who work together to help those in need within our school and local community. By participating in the Matthew Gibney Mini Vinnies Team, students are introduced to social justice issues, the St Vincent de Paul Society and living faith through positive action. The Matthew Gibney Mini Vinnies Team have a positive relationship with the St Francis of Assisi Parish, St Vincent de Paul Conference. The students and parishioners work in partnership on some projects, such as the Winter Appeal and Christmas Hampers.